What could be more spooky than walking around a party of masked guests, not knowing who might be hiding behind them? I think we’ve found a new Halloween tradition at LMP, and we’re calling it a Masquerade Soireé. But how, you ask, do we achieve this classy gathering? Simple. Your guests must show up with masks to cover their identity, only to be revealed when they find their place at the table with a photo (see our DIY Photo Placecards) of their own face. If they don’t have time to bring a mask, fear not! Follow our simple mask DIY to find all the supplies you need to make one. Have a station available for your guests to decorate a mask when they arrive. To increase your dark level of spook, be sure to choose your decor wisely. We went with deep tones with pops of metallic to give the space a haunted feel. Black, burnt orange, silver, and metallics dominated the color scheme, and we wanted to create something glam and classy with these colors. 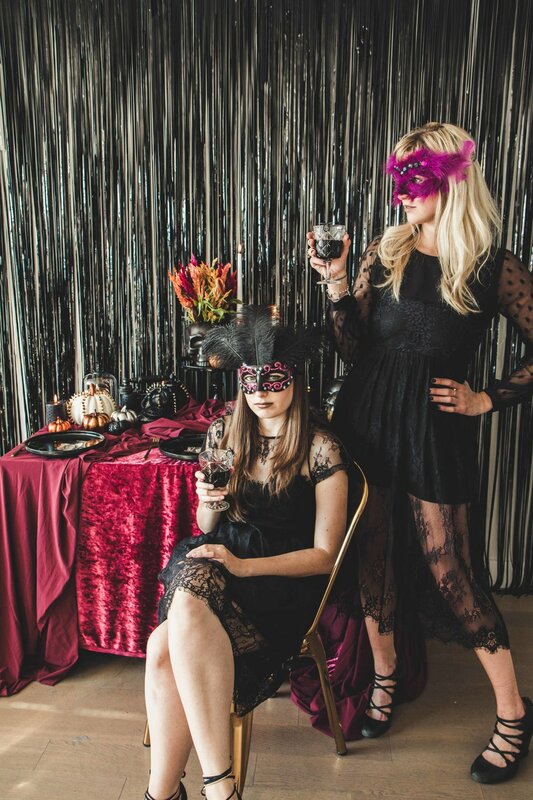 We chose a draped maroon table cloth, our favorite black fringe backdrop, black dinner plates, gold cutlery, classic crystal goblets, dark colored pumpkins, and spooky snakeskin candles. Candles are a great accent piece for any party to set the mood, but especially important at a Halloween party. Throw some fake spiders into your glassware to give your guests an extra fright. Last, but not least, we added flowers. We wanted to use something that screamed “fall” without the stale look of roses. We found some amazing flowers in earthy fall tones at the farmers market, and made our black skull jar into a vase. Spooky, beautiful, and perfect for our color palette. Throw on something black and lacy and you’re ready for your very own masquerade Halloween soireé. Have fun masking your identity, and Happy Halloween!